Although my critical practice has not been as deeply engaged with painting as other disciplines (albeit with some exceptions), I’ve been thinking a lot lately about its political potential outside of such lineages as History Painting (whether Delacroix or Kerry James Marshall) or the modern mural movement. Thus, I’ve been looking at painting projects that directly intervene into the contemporary social landscape – rather than represent it – performing an urban archeology that acts as a catalyst for change, while reinvesting the medium with political meaning. My interest came from the convergence of various projects I’ve recently discovered, rediscovered or seen, most notably the work of artist/architect Amanda Williams, whose ongoing Color(ed) Theory project was the subject of a solo show at the Chicago Art Department (CAD) (June 12-July 2, 2015) and recast in the group exhibition “After Today” at Gallery 400 (May 8-August 8, 2015). 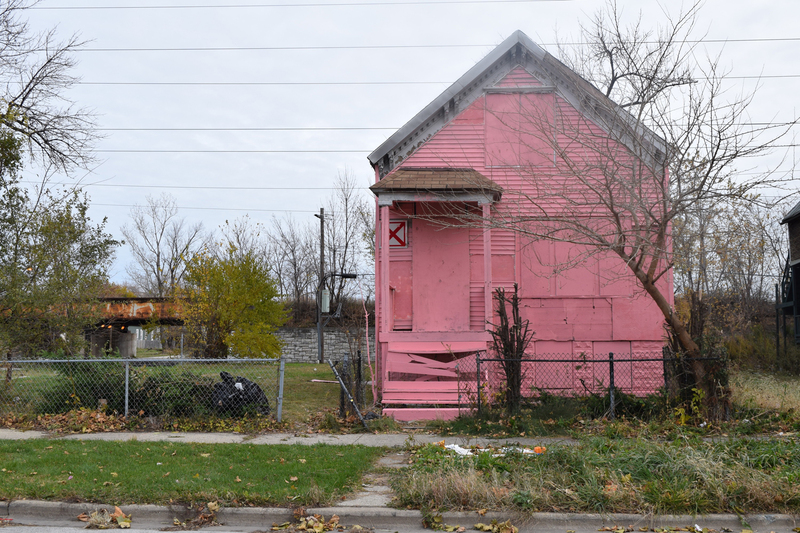 Begun in 2014 in response to the glut of foreclosed and abandoned houses that occupy the economically disadvantaged Chicago neighborhood of Englewood, Williams painted the exterior of these houses in vibrant, monochrome hues, using a socially coded palette invented by the artist yet reflective of colors found on the streets, signs and commercial spaces of the city’s South Side (for example, Harold’s Chicken Shack red, Currency Exchange yellow, Ultrasheen blue, Crown Royal purple). Amanda Willliams, Harold’s Chicken Shack, from Color(ed) Theory series, 2014. Image courtesy of the artist. Amanda Williams, Pink Oil Moisturizer, from Color(ed) Theory series, 2014. Image courtesy of the artist. Amanda Williams, Newport 100/Loose Squares, from Color(ed) Theory series, 2014. Image courtesy of the artist. 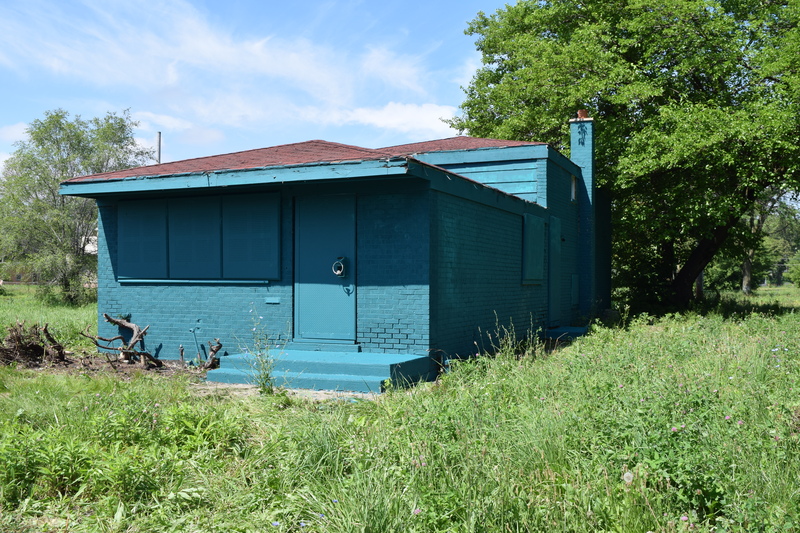 Not unlike Conceptual Art or Land Art, the primary experience of Williams’s project is through its reinterpretation and documentation rather than direct engagement, except for the local community who lives there or those who traverse Englewood. At CAD, Color(ed) Theory was represented, for instance, by a large-scale photo collage, a timeline made from copies of Cook County legal documents (foreclosure notices, demolition permits, deeds, citations, records of ownership), a wall drawing that maps Englewood, and text-based stencil cuts about color and race that read as both poems and declarations. Central to the work’s efficacy is the artist’s research and intervention, as is her commitment to remapping the visuality – or color – of race and poverty through alternative channels of circulation. One sees parallels to the work of Gordon Matta-Clark, a comparison Williams would welcome – as she has declared in her artist statement: “Think female Gordon Matta-Clark. Think Black Josef Albers.” In fact, some 40 years earlier in 1974, Matta-Clark deconstructed an abandoned suburban house in Englewood, NJ, splitting it vertically in two, in what would become one of his most well-known “building cuts” Splitting. Matta-Clark’s overall practice expanded the parameters of both architecture and sculpture, versus painting of course. His cuts and splices destabilized the physical, structural foundations of the buildings that were his chosen medium and, through unexpected, metaphoric plays of light, exposed or revealed the hidden social and economic systems that govern property ownership, particularly in cities. 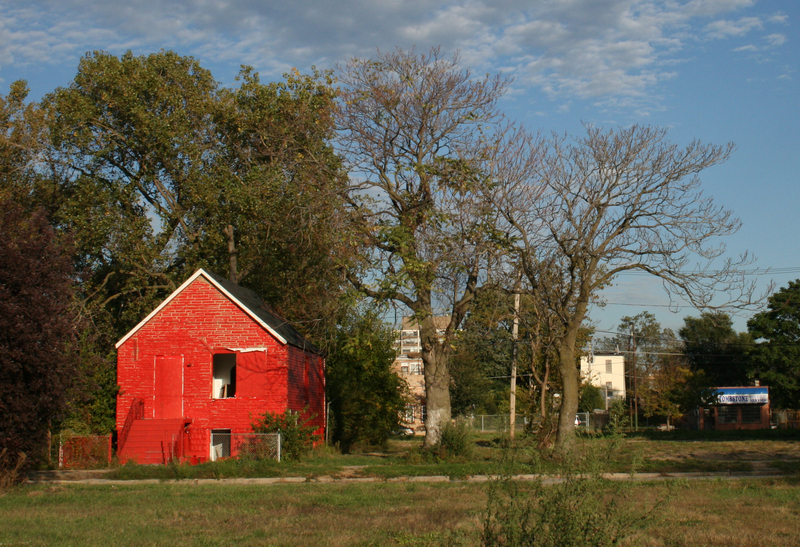 Exposing the inequities of spatial politics in the contemporary de-industrialized city is the project of several other artists, including Object Orange, a collective of four anonymous artists, who in 2006 began painting the facades of dilapidated and abandoned buildings in Detroit a bright orange. Titled Detroit, Demolition, Disney (the latter referring to the color Tiggerific Orange taken from a series of house paints issued by Disney), the project’s goal was to bring awareness to the city’s urban blight and to the some 7,000 neglected buildings that reportedly then occupied this economically depressed city. 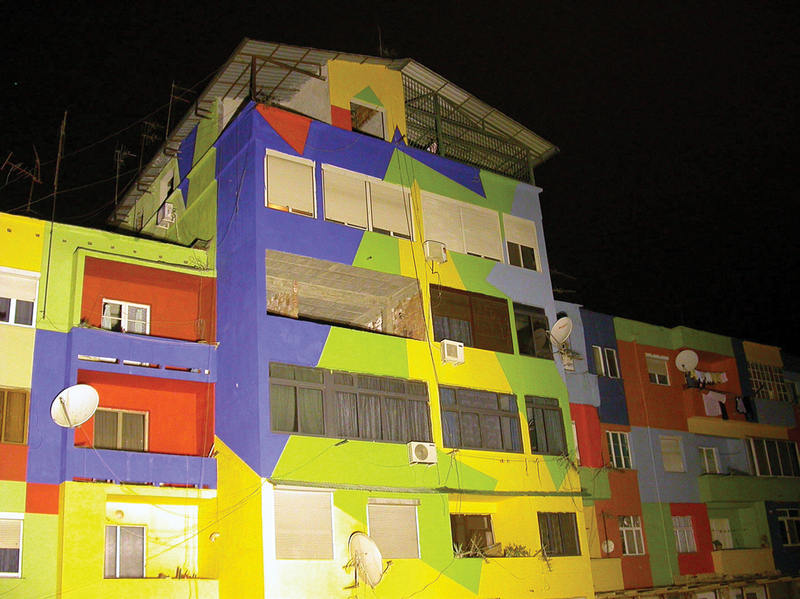 Painted guerrilla style at night and to protect the artists’ anonymity, the project did, indeed, receive attention, particularly on behalf of city authorities, who would then have the buildings demolished upon discovering their explicit transformation. With a similar but less subversive intent in bringing awareness to the divergent economies that operate within housing in urban centers, several projects have been realized through more official channels of city and cultural support. One early example is the collaborative practice of the late Kate Ericson and her husband Mel Ziegler, whose architectural interventions questioned definitions of home and often employed color using fabricated taxonomies based on the histories of their sites. Eminent Domain, a public art project created under the auspices of Sculpture Chicago’s Culture in Action (1992-93), looked at government subsidized housing in Chicago. Here, the artists worked with residents of the Ogden Courts housing project to create a paint chart, in which the colors – for example, Authority White, Equivalent Elimination (black), Hope (a sunny yellow) – reflected the social realities and inequities of their lives. For their contribution to “Places with a Past,” a series of public art projects commissioned for the 1991 Spoleto Festival in Charleston, SC, Ericson and Ziegler painted the exterior of an old house just outside the city’s historic district in a bright camouflage pattern. Despite the fact that the palette was derived from a registry of colors approved by the city’s Board of Architectural Review, the resultant pattern – bold and militant – made evident Charleston’s complex history as a site of slavery and war. 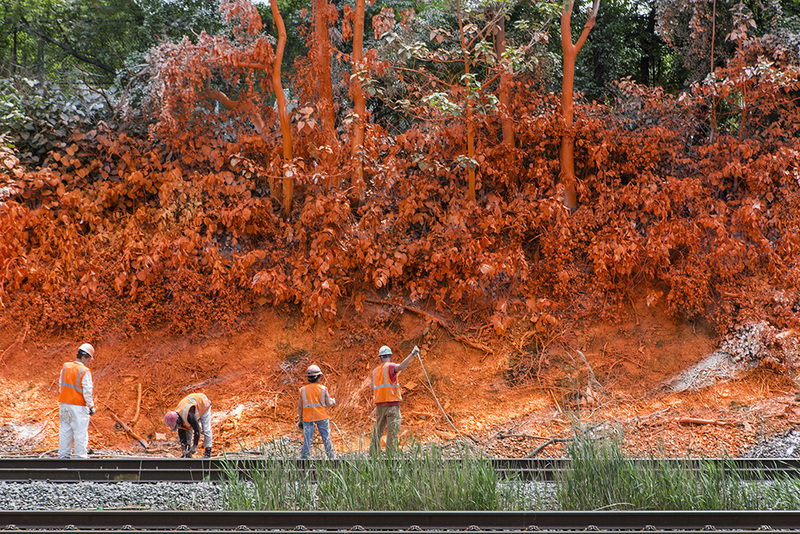 For the more recent psychylustro (2014), German artist Katharina Grosse used house paint and a spray gun to transform a five-mile stretch of Amtrak’s Northeast corridor into a “real-time landscape painting,” as noted on the website of the City of Philadelphia Mural Arts Program, organizers of the project. Seven sites along this rail line, the environs of which are some of the most impoverished in the region, were painted in large swaths of orange, green, pink and white, converting the walls of abandoned buildings, broken fences, piles of rubble and patches of overgrown grass, into sites of momentary beauty and reflection. Psychylustro reframes definitions of landscape painting as well as commuters’ experience of this blighted landscape and their view of the decayed remnants that inhabit it. Thus what is often overlooked or ignored becomes visual and present, although temporary and fleeting, even more so as psychylustro will end with its own entropy. 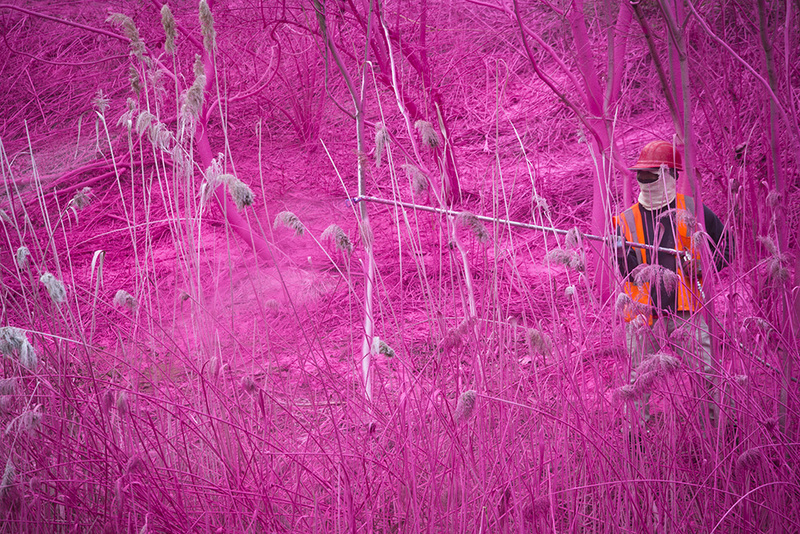 psychylustro © 2014 Katharina Grosse. Northeast Rail Corridor between 30th Street Station Philadelphia Station. Photo by Steve Weinik. This narrative of utopia/dystopia, or Boym’s “dialectical ruins,” informs architectural painting strategies elsewhere, in particular the geo-political region of post-communist Europe, where the physical and lived environment stands as a symbol of both remembrance and forgetting. 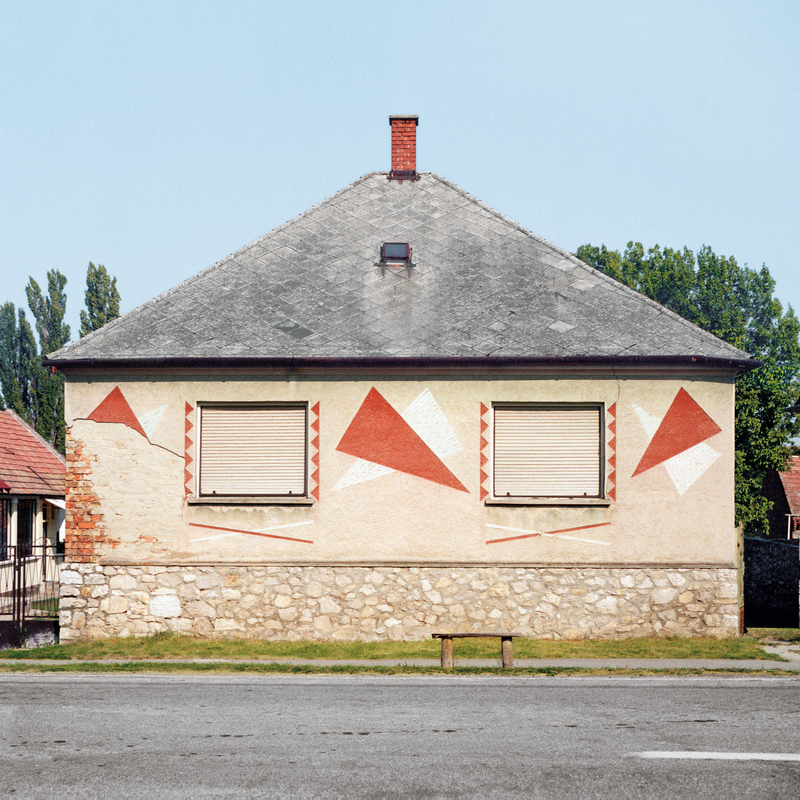 The post-war, single-family homes documented by German-Hungarian photographer Katharina Roters occupy an ambiguous space between past and present. 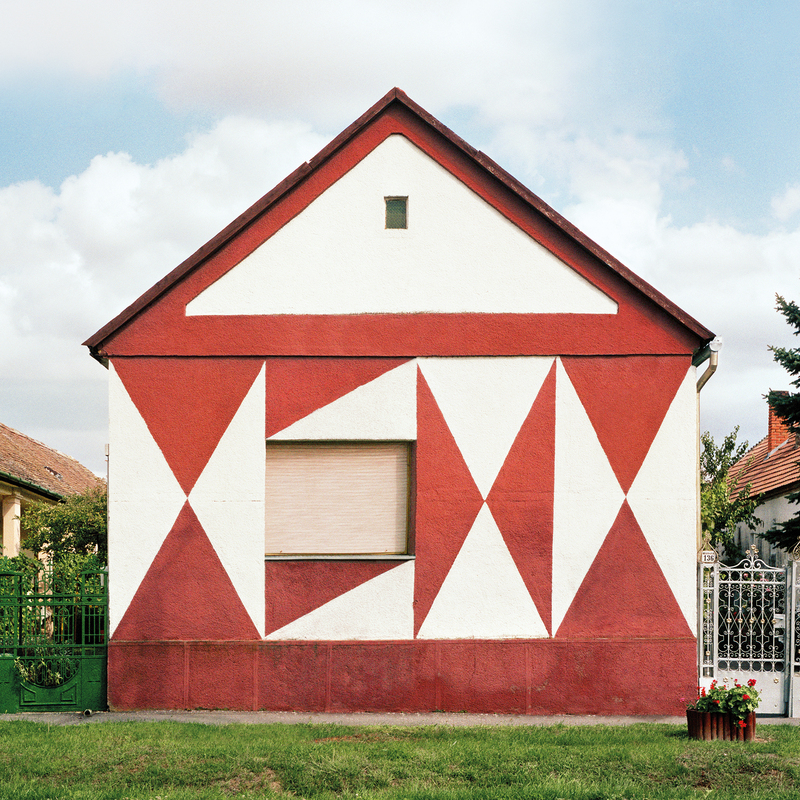 Collected in a recent book entitled Hungarian Cubes: Subversive Ornaments in Socialism, published by Park Books (2014), Roters’s images reveal a unique architectural phenomenon in Hungary’s political history: standardized cube-shaped dwellings known for their bright ornamental patterning. Also referred to as Kadar Cubes, after Hungarian socialist leader Janos Kadar, these suburban and rural houses were first built in the 1920s then revived in the mid-1950s during socialist expansion and modernization. 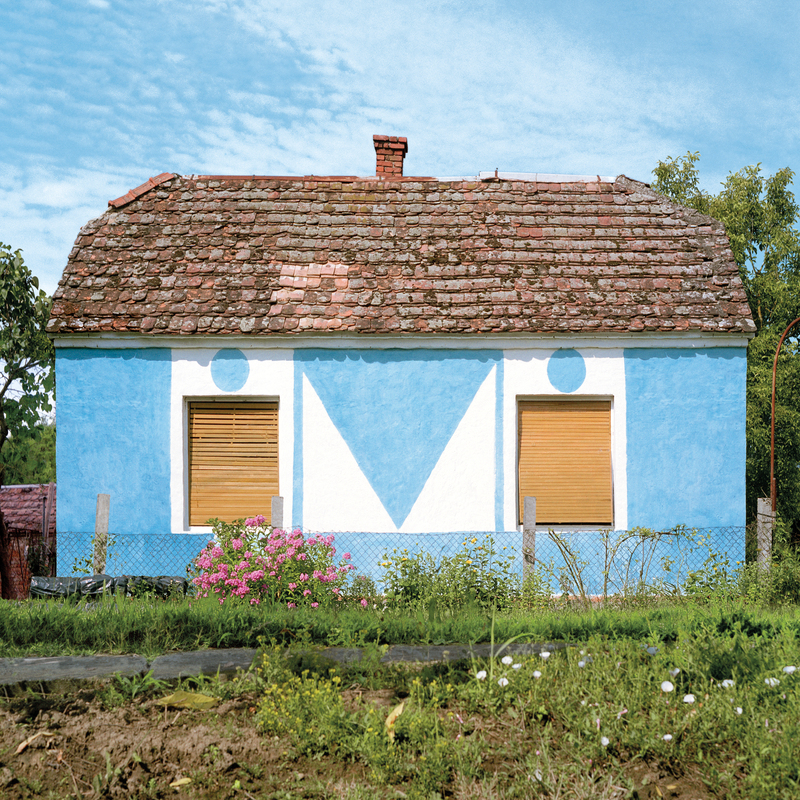 In reaction to these houses’ bland uniformity and the collective values they embodied, owners would paint their facades in bold designs, using ornamental elements borrowed from folk culture while echoing the geometric forms of Constructivist painting. Roters’s photographs capture “the almost absurd beauty” of this architectural form of subtle protest and self-expression, emphasizing their formal semblance to abstract painting. At the same time, her project preserves their existence, as today many of these houses are being renovated or destroyed. Copyright © Katharina Roters. Courtesy Park Books. Marócsa, from Hungarian Cubes. Subversive Ornaments in Socialism. Copyright © Katharina Roters. Courtesy Park Books. Ácsteszér, from Hungarian Cubes. Subversive Ornaments in Socialism. Copyright © Katharina Roters. Courtesy Park Books. Anri Sala’s video Dammi I Colori (2003), originally shown at the 2003 Venice Biennale as part of Utopia Station, profiles urban redevelopment in his native Tirana, Albania, implemented under then mayor Edi Rama, a friend of Sala’s and an artist himself. Shot mainly at night when the streets are masked in a quiet blue-black glow, the work tours Tirana’s transformation through the repainting of the facades of its worn Soviet-style apartment blocks into large, geometric planes of vibrant colors. A voice over and English subtitles reveal Rama’s aspirations: “[It is a] question of finding out how a city can become habitable and how to transform it from a city doomed by fate to a city where one wants to live.” In the end, Tirana becomes a living canvas, a symbol of hope, and a model for progressive artistic ideals. Anri Sala, Dammi i colori, 2003. Digital video projection, color, sound: 15 minutes, 25 seconds. Courtesy of the artist and Marian Goodman Gallery. So, too, do the other projects I’ve discussed here. And while my exploration is by no means exhaustive, it does attempt to connect important artistic practices that merge painting, architecture and urbanism in profound ways. See Imogen Racz, “Gordon Matta-Clark, Splitting and the Unmade House”: http://theibtaurisblog.com/2015/01/26/gordon-matta-clark-splitting-and-the-unmade-house/. Hi Susan! Great piece! Thought about another artist that should be on your radar regarding this projects. Thanks Edra! Glad you liked it and many thanks for the info about Rosado-Seijo’s work. Great article Susan! I just discovered it. Best to you and Larry. Thanks Mark. Hope all is well with you.